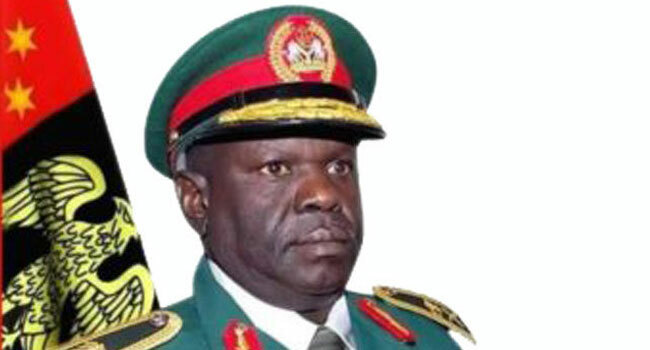 The State High Court sitting in Jos has remanded 19 persons in prison custody for their alleged connection with the disappearance and death of retired Major General Idris Alkali, the former Chief of Administration (Army). The presiding judge, Justice Daniel Longjin, gave the order on Monday in Plateau State during the arraignment of the suspects in court. The suspects were arraigned by the State Police Command on charges bordering on conspiracy and culpable homicide. All the accused persons pleaded not guilty after the charges were read to them. Justice Longjin thereafter adjourned till December 10 for the hearing of the case. The suspects were arraigned the day after they were paraded by the Public Relations Officer in the state, Mr Tyopev Mathias. Addressing reporters on Sunday, Mr Mathias said the late Army General had left Abuja for Bauchi en route Jos on September 3 before he was reported missing three days letter. He added that the tracking of Alkali’s valuables led detectives alongside military personnel to a pond in Dura-DU in Jos South Area of Plateau State. Following a series of developments, Mathias revealed that the military handed over 13 suspects arrested to the Police Command for investigations on October 17. He added that after a painstaking interrogation, the command declared eight suspects wanted and six persons have already reported to the police. Below are the initial thirteen (13) suspects taken over from the Military and their levels of involvement so far. · Was at Lapande with other youth. · He was at Lapande on 03/09/2018 with other youth. · Saw when and how the General was killed. · Knows the people that killed the General. 5. John Alkali ‘m’ 21yrs. · Arrested with a locally made gun with one(1) round of live ammunition. · Resides in Doi village. · Arrested by the Military during search and rescue. · Owns and operates a block industry beside the pond in Dura where the car was recovered. · He concealed the information until his arrest. · Employed by Stanley at the block industry. · Saw those that blocked the Roads on 03/09/2018. · Concealed the information until his arrest. · Had information on the dumping of the car into the pond but concealed it until his arrest. · Arrested by the soldiers during search operation. · Owns a Restaurant/Drinking joint in DU-Daddy’s Bar and Restaurant. · He was arrested during search/rescue operation. · His business joint believed to be where some of the principal suspects at large normally meet to plan their activities. · He knows some of the principal suspects. · The vehicle was recovered in a pond in his area. He has knowledge of the entire exercise as the youth of the area respect and obey him. · He is from Doi-DU and Mai-angwa of Latiya. · He is a friend to Da. Chuwang AKA Mourinho, the principal suspect who is at large. · He is a son to Pam Gyang Dung ‘m’AKA Boss. · One (1) locally made pistol was recovered in his house during cordon and search operation.